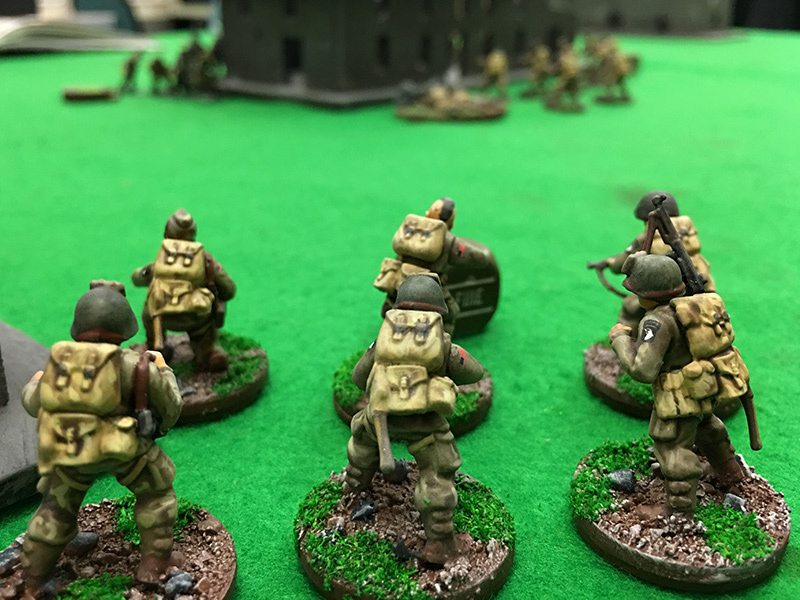 This week I took my newly painted US Airborne Platoon down to the Wargames Club. 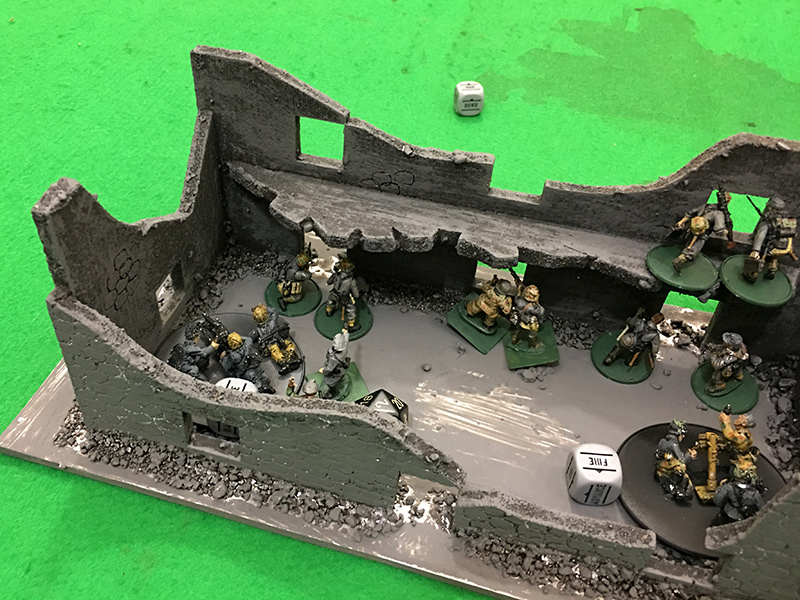 I replaced the GI section I used last time with a squad of the new 101st Airborne so I had a completely airborne 100pts army. 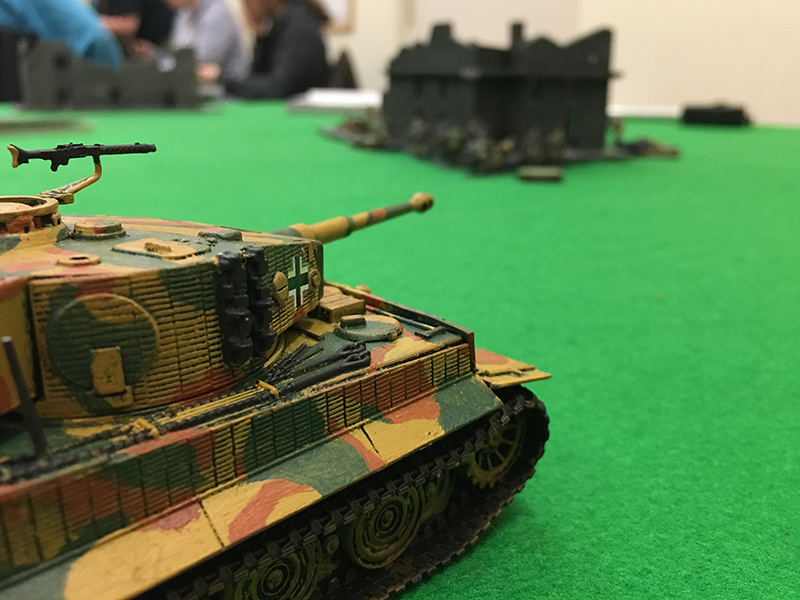 As usual, I took on Mark and his Germans with his Tiger and this week we decided to run one of the scenarios from the Bolt Action rulebook. As Mark was a little late, I selected the “Hold until Relieved” scenario. This is a scenario where the defender starts within one move of an objective and has to hold it until the end of the game. 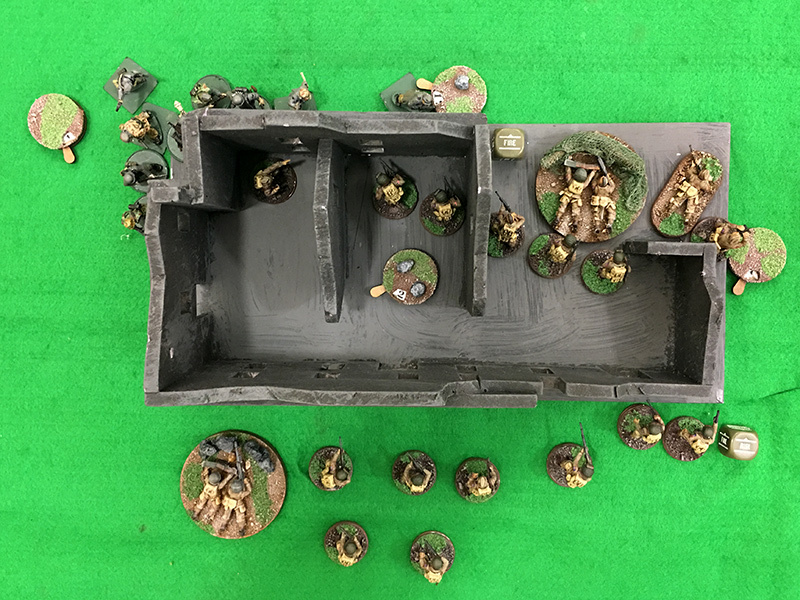 As the defender, I got to place one unit 6 inches from the objective which was the ruined house in the middle of the table. Half my units had to be held in reserve and the others came on at the edge of the table. 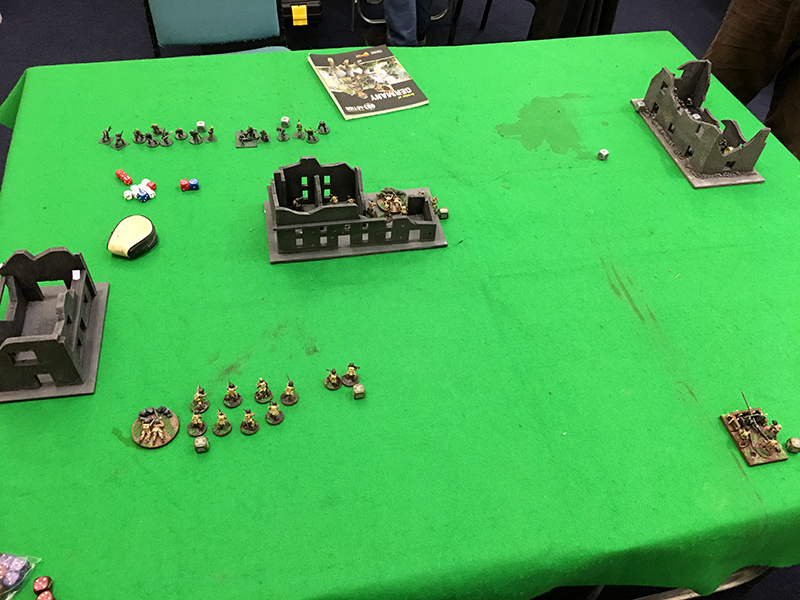 Mark got to place his troops anywhere on the table which must have been at least 18 inches from the objective. Only infantry could be set up which meant he had to keep his Tiger in reserve. On move one, the 1st section, 82nd Airborne moved into the ruined house and set up. 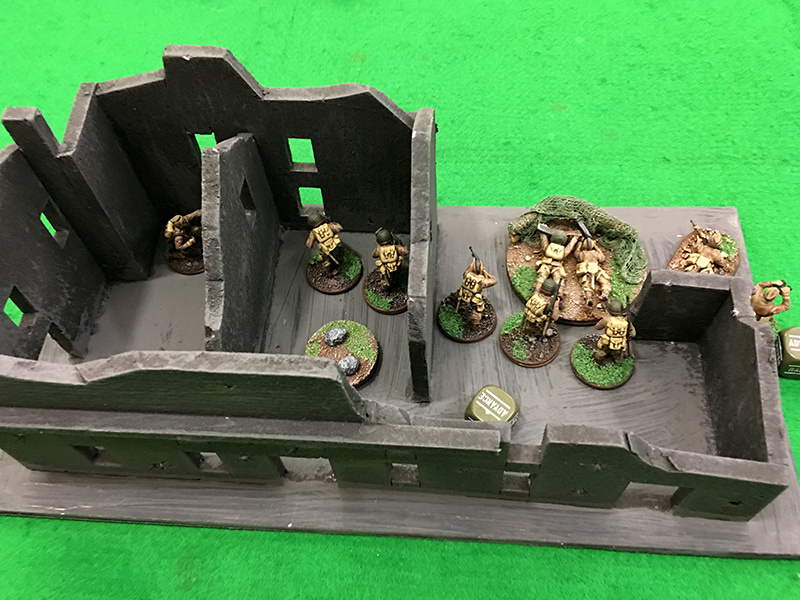 Mark put two MG teams, a mortar and an infantry unit in the ruined house on the German left flank with two infantry units on the right flank table edge. The sniper team moved up to the objective. I brought on the 57mm AT gun, bazooka team and 2nd section 82nd Airborne on my edge. 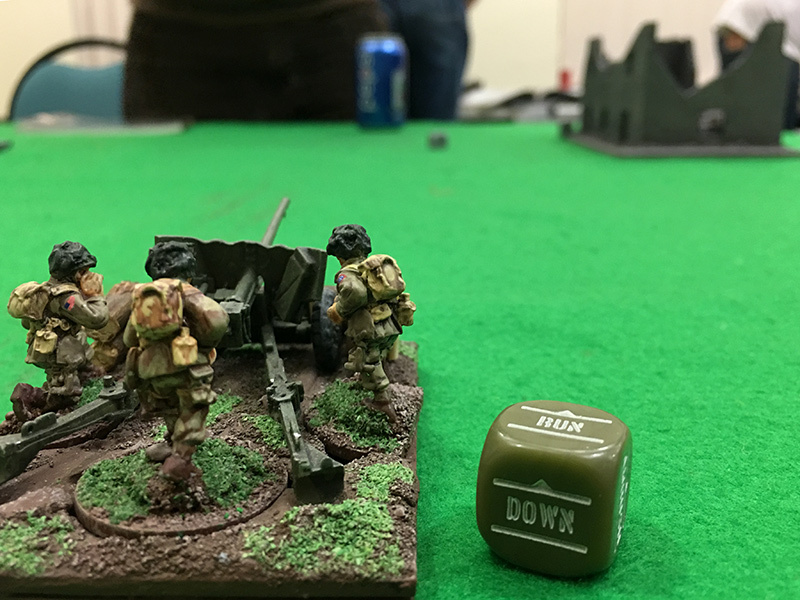 Mark’s mortar took its first shot of the game and got a direct hit on a dice roll of 6 taking a first casualty of my BAR gunner in the objective. On turn two I tried to bring on my Sherman to take some heat away from the infantry who were being machine gunned and High Explosive shelled by the Tiger, but it failed it’s order test and would have to wait until turn three. 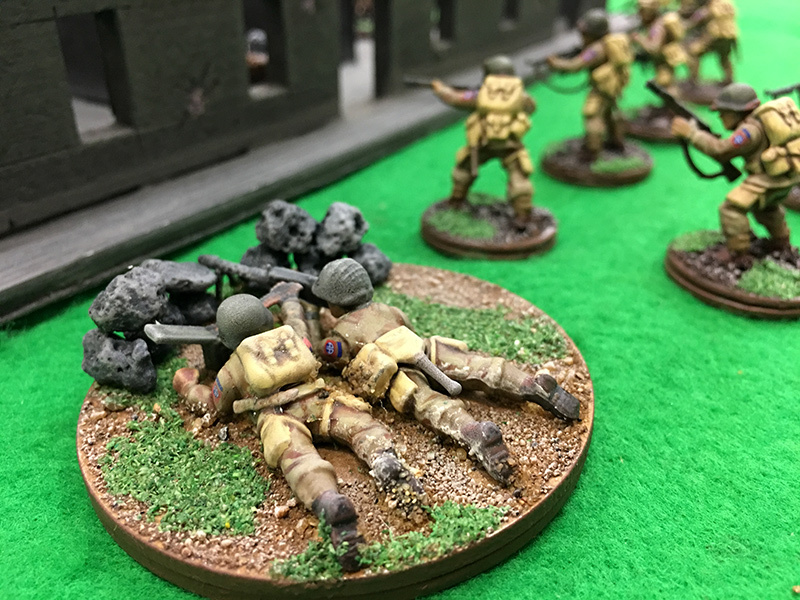 The Airborne squad in the ruins managed to take a few casualties from the advancing German unit knocking out 4 with one volley. 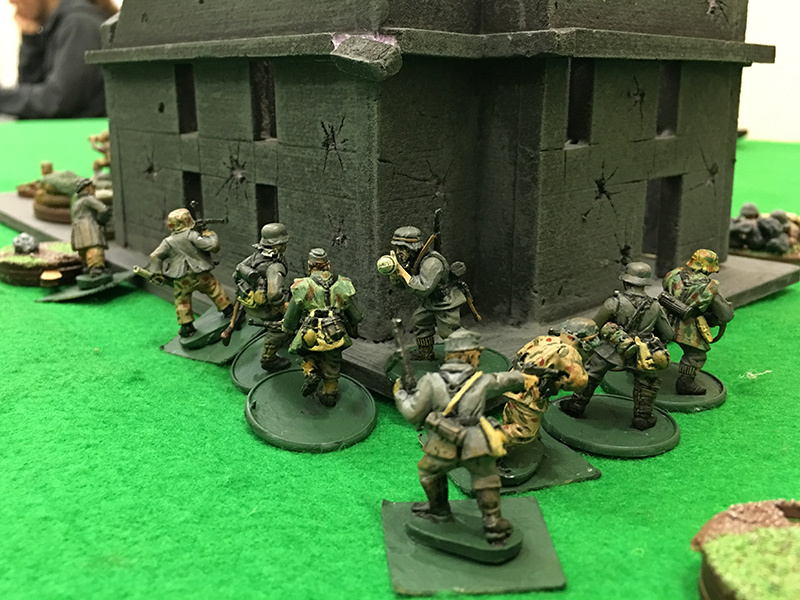 The other German unit advanced to the side of the building. 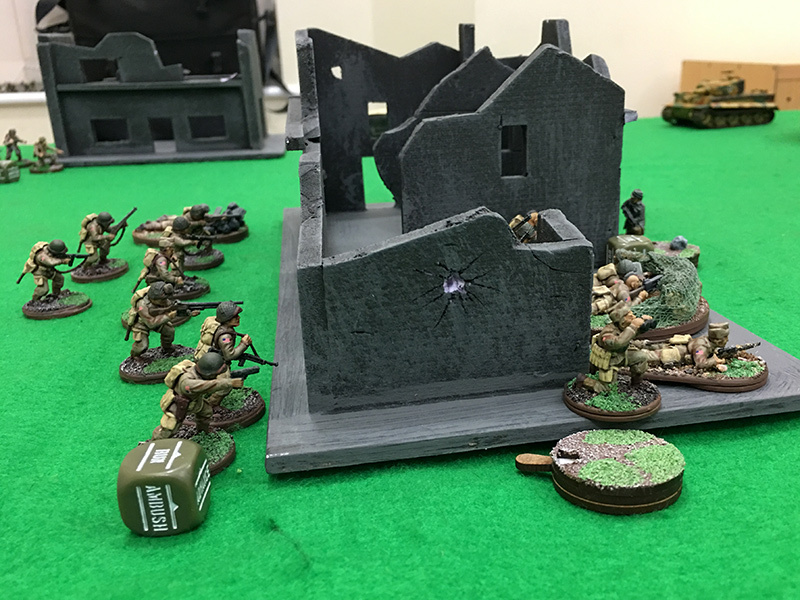 Unfortunately, the Germans in the other ruins managed to take out the bazooka team with their first shots. The Germans came right up to the ruin walls preparing to assault the US Airborne inside while the 101st came up to provide support. The AT gun was pretty ineffective and the German mortar missed on its second shot. 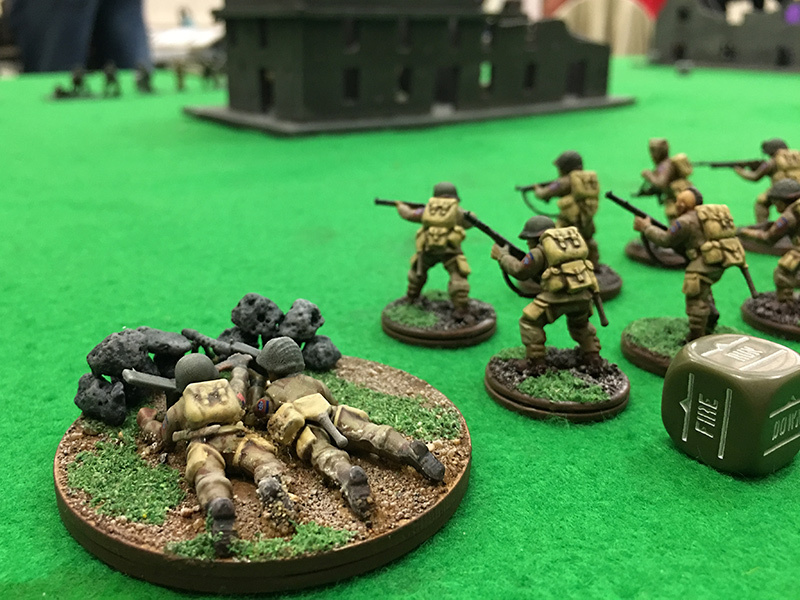 The Germans ran into the ruins and after a short tussle, they beat the Airborne squad. 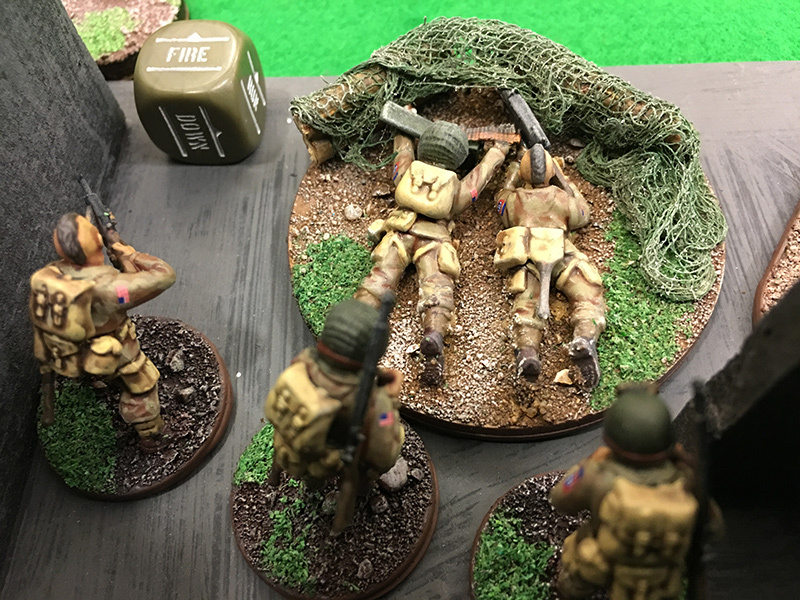 Fortunately for the Americans, the 101st unit just outside the ruins were able to take casualties from the Germans and they didn’t last long as the ruins were retaken by the Americans. 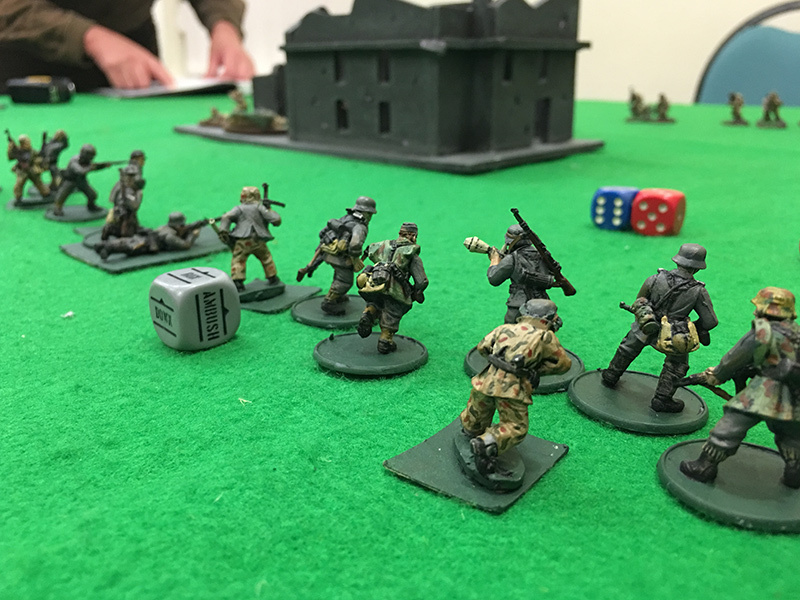 Time ran out after 4 turns and the game ended with the Americans holding on to the objective.